The National Automobile Dealers Association has agreed to sell an 82-year-old institution, its Used Car Guide business, to J.D. Power. J.D. Power executives declined to release any of the financial details of the deal but said it will yield shared cost savings and lead to more comprehensive data and new products. NADA Used Car Guide provides U.S. retail, loan, trade-in and auction used-vehicle values. The deal, still subject to regulatory review, is expected to close early in the third quarter, the companies said in a joint statement. NADA and J.D. Power will continue to share data and co-host conferences and industry events. The NADA Used Car Guide name will be used by J.D. Power for an undisclosed period before transitioning to the J.D. Power brand, a joint statement said. Under the terms of the deal, NADA members will continue to receive a subscription to the Guide as a membership benefit, NADA President Peter Welch said in the statement. J.D. Power, a unit of McGraw Hill Financial, is a global marketing information company. Its Power Information Network provides real-time automotive information based on the collection of daily new- and used-vehicle retail transactions. NADA Used Car Guide had its origins in 1922, five years after dealers formed NADA, when the association began studying used-car values at the U.S. government’s request. 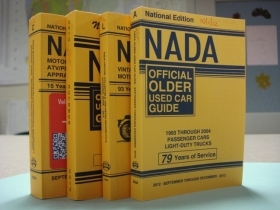 In 1933, the U.S. government determined that existing used-car guides were biased and asked NADA to publish the NADA Official Used Car Guide (NADA Guide) as part of the National Industrial Recovery Act, according to NADA’s website. During World War II, with production of new cars halted, interest in used cars skyrocketed, as did interest in the Used Car Guide. In 1946, NADA Guide subscriptions jumped to 50,000 from 28,000. In the postwar era, the distinctive orange NADA Guide became a staple at dealerships and lenders. Growing demand for data sparked competitors. Today, Kelley Blue Book, Edmunds.com, Autotrader.com, Black Book and ALG, among others, track used-vehicle values. To meet that competition, NADA Used Car Guide has branched out, adding analytics and online and mobile-optimized tools. Today, Mike Stanton, COO of NADA Used Car Guide, told Automotive News, the print product has become a “small part of our business” as customers have migrated toward electronic products.